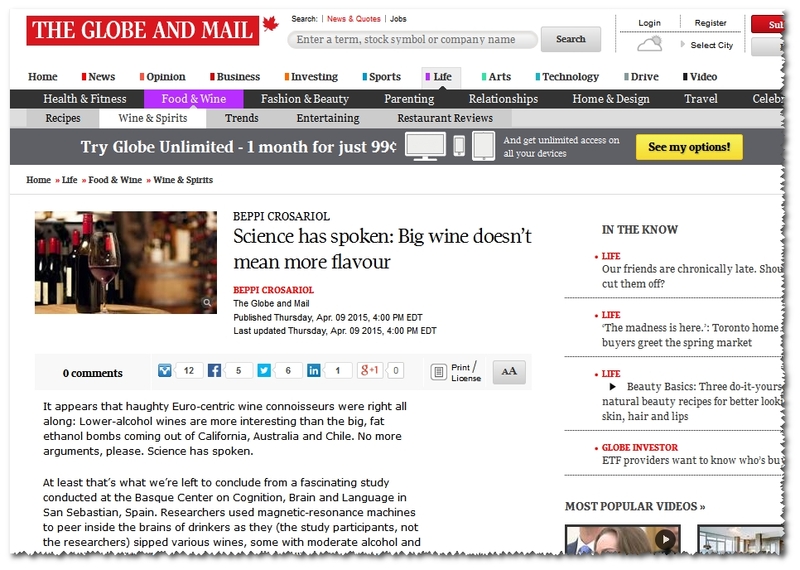 That’s the message we need to repeat to our geeky wine selves after reading the article “Science has spoken: Big wine doesn’t mean more flavour” by Beppi Crosariol in The Globe and Mail. In case you missed it, the scoop is that a rather cleverly executed experiment involving 26 “relatively inexperienced wine consumers” who tasted wine and had their noggins MRI scanned revealed that those tasters had a bit more brain activity happening when the wines that they tasted were lighter-bodied and lower in alcohol. Is this finding interesting? Hell yes. Is it definitive enough that we can draw any serious conclusions from it? HELL NO! Which one wins – the brain activity or our decision to tell ourselves that we like the bigger wine anyway? Repeat cycle at step 2. The question isn’t whether or not people will like different wine styles, or which are inherently superior/more interesting/better/whatever. The real question is, what are you going to do to help break the cycle? Neither greater brain activity during consumption nor stronger attention to aroma and flavor nuances necessarily has any correlation to preference. If the aromas being attended to are vegetal or sulfurous, or the tastes bitter or unduly acidic, greater attention may not be a positive. it is interesting to note that so-called “super-tasters” tend to choose blander food and drink because their more sensitive sensory systems are in a sense assaulted by stronger tastes, making the more robust foods and beverages less preferred. Richard – even more reasons why we shouldn’t draw too many conclusions prematurely from this study. Wonder if the enhanced brain activity was due to the lower alcohol, whereas the higher alcohol wines muted the brain activity? I’m a firm believer in drinking what you like, not what Robert Parker et al, your wine geek neighbor, or the overzealous salesman in the wine shop tells you you should like. I did a Cabernet Franc tasting last night with roughly a dozen friends. 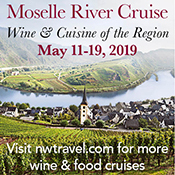 All 6 wines were well made wines by highly regarded winemakers and respected wineries. The larger, richer mouthfeel wines were preferred. Those less preferred by my group may very well be more highly preferred in a different demographic. That’s what’s so fun about wine. Maybe I should rent a portable MRI scanner for my next tasting or party….. These small studies are the bane of my existence. Six people studied here, a dozen there, no real controls, etc. OK, I guess I don’t really object to the studies as much as I do the willingness of people reporting on them to hype a finding without looking closely at the whole thing. I noticed it a lot when I was doing environmental work, but even more so now that I’m in the wine business. Firstvine – yeah, wine seems notorious for this sort of thing. An earlier wine consumption study using a functional MRI . . . testing price vs. perceived quality. ADDENDUM: Go to http://www.news.com/8301-13580_3-9849949-39.html to see the accompanying exhibits. Exhibit # 1 caption: This graph shows the activity in the brain’s pleasure center; there’s more activity with wine subjects think costs $90 a bottle (top line) than the same wine priced at $10. The arrow shows the moment when the subjects started tasting the wine. Exhibit # 2 caption: This chart shows that people ranked taste of a $45 wine higher than the same wine priced at $5, and the same for a different wine marked $90 and $10. Bob – you get what your brain thinks you pay for, I guess! Such studies beg a related question: How would the subjects react on assessing their satisfaction/pleasure quotient if the choice was between paying for the wine — versus being “gifted” with it for free? Do we value gift wines as much as we value wines we pay for — earned by the sweat of our brow?
. . . We make a significant investment — of money, time or emotion — in some project, relationship or business deal, and it doesn’t seem to be working out. Do we continue to “throw good money after bad” or do we “cut and run” and “stop wasting time”? What’s the right way to think about such decisions? Instead of thinking about the past, what we should be doing is thinking about the future. . . .
One can think through a problem in a logical and rigorous way, and formulate a sensible course of action, only to discover that it doesn’t work out. Good decisions do not guarantee good results (just as bad decisions don’t guarantee bad ones). Yet people seem willing to waste even more (time, money or lives) to justify what they have already spent and avoid that sick feeling of failure. . . .
. . . we have learned from research on decision-making is that people hate to suffer losses — and they feel far more pain from the loss of a sum of money than they experience pleasure from the gain of the same sum.